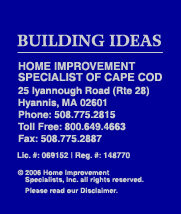 Home Improvement Specialists of Cape Cod is a Licensed Contractor and a Registered Home Improvement Company. Our lead carpenters are Licensed Construction Supervisors. Home Improvement Specialists is fully insured for Workers Compensation and General Liability. Our Production Department is managed by professional and experienced people dedicated to quality workmanship and committed to meeting our customer's needs. It is their goal to make your remodeling project a pleasant and enjoyable experience. Our communication and scheduling skills help ensure the project's success.